A separation agreement is an agreement made by a married, civil union or de facto couple that they’ve decided to live apart. It can be a spoken or written agreement. 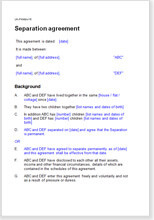 A separation agreement can be registered in the Family Court as a “consent order”. This means that if anything goes wrong, it can be enforced just like a Court order. Before we tell you about this document, please note that a separation agreement is not binding in law in the same way that a commercial contract would be. A judge can still change the terms, whether your agreement is based on our template or is written for you by your solicitor. We explain in more detail further down this page. how you’ll divide your property. The agreement is straightforward and easy to complete. We advise that you arrange for a lawyer to witness you signing the agreement and certify that you understood the effect.